Prescott Valley, Arizona | December 7, 2010 | Vickie L. Sandy, Specialist of the Air Traffic Control department at Lockheed Martin Corporation, has been recognized by Elite American Executives for demonstrating perseverance, guidance, and excellence in aviation services. Specializing in air traffic control, Vickie L. Sandy possesses over 20 years of professional experience in aviation services. As a Specialist at Lockheed Martin Corporation, she is responsible for supervising air traffic control, civilian aviation and flight plans, as well as advising on restrictions and meteorological conditions. Ms. Sandy’s professional history is extensive. Prior to joining Lockheed Martin Corporation, she worked for Automated Flight Services under the Federal Aviation Administration from 1987 to 2005. She also served as an emergency medical technician and paramedic for 15 years, and continues to give speeches on topics ranging from safety to CPR. She enjoys the daily challenges and the diversity in her current position at Lockheed Martin Corporation, and attributes her success to her flexibility, independence, self-driven nature, and being a self-starter. She advises others in the industry to persevere in order to achieve your goals. Of course, Ms. Sandy’s educational background has also served as a platform for her continued success. Ms. Sandy holds a bachelor’s degree from Fairmont State University and is a trained paramedic and emergency medical technician. Her professional affiliations include the National Association of Air Traffic Specialists, National Registry of Emergency Medical Technicians and International Association of Machinist and Aerospace Workers. 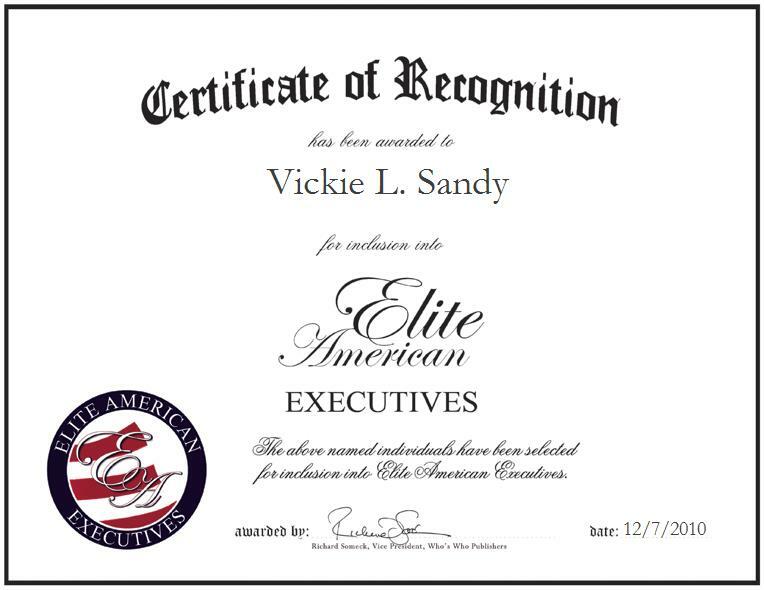 Vickie L. Sandy was originally selected for inclusion in EliteAMERICAN Executives in December 2010. We are proud to be featuring Ms. Sandy again in EliteAMERICAN Executives for 2015. Has any of it ever been published? In your category, would you be representing aerospace, as opposed to government? That’s a hard one… because we’re basically doing a government job. Why have you been successful in your field? I’d say persistence, I think. When you started [your career], what were you actually doing? Once you retire, is there anything you’re thinking of doing? You know, I’ve never really contemplated that. I can see you being a consultant, or a public speaker. If I were forced to retire, I might’ve been looking at something like that. How long have you been working your shift? Let’s see here… Including government, I’ve probably done straight mid-shift from the mid-90’s. If I’d had my way, I’d have been mid-shifted from the first day I walked through the door… most of us that are on it are admittedly nocturnal types. What made you pursue a government-related job? Initially, it was because it presented a stable state of employment. As I gained experience in it, it morphed into enjoying working in a unique career field. How do public servants make up the backbone of this country? I see public servants as the internal worker bees that keep the hive that is the USA functioning steadily and uninterrupted regardless of the party in charge at the time. What makes you an essential part of how America functions? My role in the Air Traffic System is to facilitate services for general aviation pilots. I provide them safety and meteorological information, and attempt to interpret and/or convey those items to them in a manner that they can understand via telephone and radio. As a facilitator, I sometimes have to find the means to enable a square peg (the private pilot) fit into the round hole (FAA ATC system) smoothly. How has the recent economic downturn affected the way that your office carries out its daily operations? Currently, we are understaffed; not just locally, but nationally. We’ve had to reorganize our work sections and redistribute duty responsibilities in a way to accommodate the demand of our customers (both the pilots and the FAA) while maintaining attention to detail and safety. This entry was posted in aeronautics, Uncategorized and tagged air traffic control, aviation, FAA, flight plans. Bookmark the permalink.